In the PS4’s very good new Spider-Man game, Peter Parker spends a lot of time web-swinging through Manhattan in pursuit of truth, justice, and collectables. As he flings himself about, he frequently gets calls from friends on his radio, and he responds differently depending on whether or not he’s exerting himself. I bought Spider-Man when it came out last Friday. Right from the start, I noticed that when Peter talked on his radio while swinging, he sounded a little strained, like he was exerting himself. Then I noticed that when he talked on the radio while standing still on a rooftop, he sounded like he was standing still. Was I hearing things, or was the game quietly switching between two different voice takes behind the scenes? “It’s been a group effort of the highest level,” chimed in voice-actor Lowenthal. 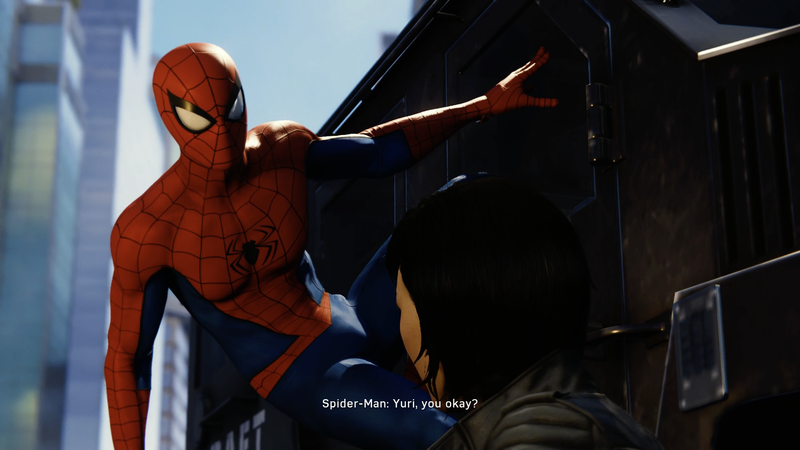 Another pair of fun details: Spider-Man voice actor Yuri Lowenthal spends a lot of time in the game addressing a character named Yuri, who is actually played by his wife, actor Tara Platt. The voice-switching trick strikes me as the kind of thing that isn’t exactly rocket science on a technical level, despite how cool it seems when you notice it and point it out. By highlighting it, I’m not suggesting that Spider-Man is doing something completely revolutionary, but Insomniac’s approach does strike me as unusually slick and far-reaching, especially for an action-adventure game like this. The switching of vocal tracks works particularly well when combined with some of the other smart dialogue tricks Spider-Man uses. One of those includes the way Peter realistically resumes conversations or dropped calls after they are interrupted by the player, similar to systems seen in Grand Theft Auto V or this year’s God of War. If you pause or otherwise interrupt a conversation, he’ll take the next opportunity to call the person back and resume the conversation with something along the lines of “Okay, so as I was saying…” These are just a couple of the many small, carefully crafted details that make Insomniac’s superhero simulation a bit more believable, and a lot more impressive.